Here is an excerpt from today’s subscriber story from my “How To Heal Autoimmune Diseases Without Meds,” Summit Series. There is healing all around us! The third reason I’m writing is in response to your (daily) invitation to share my healing miracle with you. As a result of coming into this world by C-section, not being breast fed, having a steady-supply of antibiotics, being raised on the S.A.D., replete with TONS of sugar, (toxic) sodium chloride, refined white wheat-flour, and refined, bleached, and denatured vegetable oils (trans-fats), completely processed (non-foods) packaged products, with ZERO fresh fruits and vegetables, I ended-up with colorectal cancer (what a surprise). After being constipated for six weeks, and only able to pass blood (instead of a stool), I would vomit anything I tried to eat because of the blocked bowel. My digestive tract was completely septic. The only thing I knew to do (at THAT time) was go to the hospital. What a BIG mistake! After the x-rays showed that 2/3 of my colon was cancerous, they told me they were going to have to rush me into surgery to perform a colectomy, removing 2/3 of my colon. I would end up with a tube coming out of my gut, leading to a bag to collect my feces, IF I even survived the surgery! My quality-of-life would be drastically diminished, with a high risk of infection, and I may last another six years that way (it gets even better). And, that if I didn’t go through with the surgery, I would only live another couple of weeks! To me, it looked dismally bleak EITHER way, so I checked myself out of the hospital, and went home to die peacefully (smartest decision I ever made). That was 47 YEARS ago! Since I couldn’t hold down food anyway, I began fasting. Then, I found a book by Jethro Kloss: “Back to Eden.” After reading about his experience overcoming cancer, and how I needed to cleanse the liver, I started chewing on the (fresh) roots of burdock and dandelion (for hours), then spitting out the pulp. After six weeks of that, my appetite started to return. Having such good results following his advice in purifying my blood, I began following more of his advice: for several more weeks I began alkalizing my system by just consuming fresh citrus. Next, I began juicing celery and beets, and growing sprouts (all kinds). 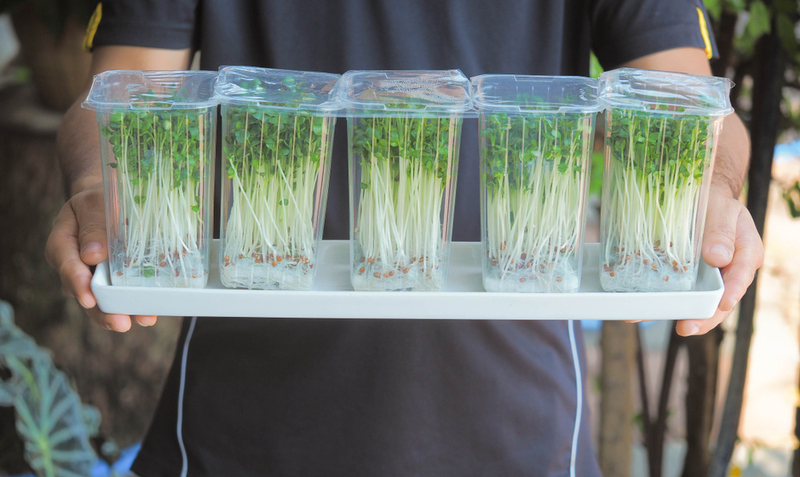 Soon, a few restaurants and health-food stores wanted me to supply them with sprouts. Within a year, I was supplying them to the Kroger supermarket chain (2 tons per week). When I read that we need FIBER to keep things moving through our digestive tract, and that flesh-foods have ZERO fiber (they just stagnate in your colon, putrefying, and feeding cancer cells), and form an acidic environment, I gave up meat, fish, and dairy products (FOREVER). I’m still pursuing healthful living, detoxing, and immune strengthening practices to this day! That’s how I landed on YOUR summit, of course. There are an ever-increasing number of us who are taking our health into our own hands, or, more appropriately, I should say: putting our health in NATURE’S hands. I became VEGAN before it was even a WORD. Back then; they just referred to us as STRICT-vegetarians. And, it was only about .001% of the population. We’ve come SUCH a long way, out of necessity! It brings me such joy to witness this mass awakening. Pirie is a TedX speaker, author, and a Soul-Centered Life Coach. With over 20 years in front of the camera, Pirie Grossman understands the power of storytelling. After success in commercials and acting. Pirie spent 10 years reporting for E! Entertainment Television, Entertainment Tonight, also hosted ABC’s “Every Woman”. Pirie’s work off-camera capitalizes on her strength, producing, bringing people together for unique experiences. Pirie produced a Children’s Day of Compassion during the Dalai Lama’s visit in Sun Valley, ID in 2005. 10,000 children attended, sharing ideas about compassion with His Holiness. From 2006-2009, Pirie Co-chaired the Special Olympics World Winter Games, in Idaho, welcoming 3,000 athletes from over 150 countries. Pirie founded Destiny Productions to create Wellness Festivals and is an Advisory Board member of the Sun Valley Wellness Board. In February 2017, Pirie produced, “Love is Louder”, a Brain Health Summit, bringing in Kevin Hines, noted suicide survivor to Sun Valley who spoke to school kids about suicide. Sun Valley is in the top 5% highest suicide rate per capita in the Northwest, prompting a community initiative with St. Luke’s and other stakeholders, to begin healing. Pirie lives in Sun Valley with her two children, serves on the Board of Community School. She has her Master’s in Spiritual Psychology from the University of Santa Monica and is a Soul-Centered Life Coach.